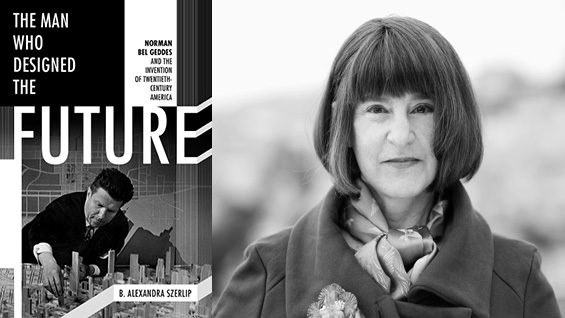 B. Alexandra Szerlip gives a free, public talk about her new book, The Man Who Designed the Future: Norman Bel Geddes and the Invention of Twentieth-Century America (Melville House). A ninth-grade dropout who found himself at the center of the worlds of industry, advertising, theater, and even gaming, Norman Bel Geddes designed everything from the first all-weather stadium, to Manhattan’s most exclusive nightclub, to Futurama, the prescient 1939 exhibit that envisioned how America would look in the not-too-distant sixties. In The Man Who Designed the Future, B. Alexandra Szerlip reveals precisely how central Bel Geddes was to the history of American innovation. He presided over a moment in which theater became immersive, function merged with form, and people became consumers. A polymath with humble Midwestern origins, Bel Geddes’s visionary career would launch him into social circles with the Algonquin roundtable members, stars of stage and screen, and titans of industry. B. Alexandra Szerlip was a two-time National Endowment for the Arts Writing Fellow, a Yaddo fellow, and runner-up for London’s Lothian Prize for a first biography-in progress. She has contributed to The Paris Review Daily and The Believer, among other publications, and has worked in professional theater, as a book editor, sculptor and graphic designer. Raised on the East Coast, she lives in San Francisco.